Progressive Charlestown: Put that phone away! 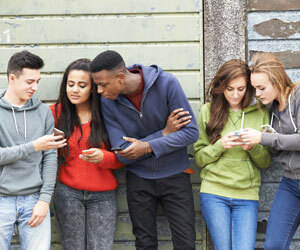 "There is plenty of evidence to show how teenagers aren't getting enough physical activity, or sufficient sleep, or keeping their screen time in check. But this is the first time these three factors, which have a crucial bearing on a child's health, have been analyzed together among a nationally representative sample of U.S. adolescents," said first author Gregory Knell, PhD, a postdoctoral research fellow at UTHealth School of Public Health in Dallas. "The results are a wake-up call for everyone who wants to make sure our children have a healthy future." The study further examined other attributes of the child -- age, race or ethnicity, weight, and mental health -- and how these were linked to sleep, physical activity, and screen time. "These findings are only scratching the surface and demonstrate a need to learn more about the role parenting style and home environment may play in increasing or curtailing these behaviors," Knell said. "Although the study confirms and further reveals how few children are leading optimal lifestyles, it also raises many questions about what can be done to reverse that trend and improve their health."